This week we are covering the theme Exploring Our World: Social Studies and Science as part of the Virtual Curriculum Fair. This is one area where I've always known what is "right" for our homeschool. What better way to explore the world than with first hand experiences and exciting stories? I believe field trips, nature study, science experiments and hands-on experiences are an excellent tool for bringing these subjects to life, but I use living books as the core of our science and social studies curriculum. I am an eclectic homeschooler, but I identify strongly with the Charlotte Mason philosophy, and one of the first things that drew me to the philosophy was the use of living books. Using real books as the heart of my homeschool just seemed natural. Using excellent books makes even more sense. Where do I find my living books? If you want actual curriculum, I don't need to reinvent the wheel - Jimmie's Collage has a great list to get started - Ultimate List of Living Books Based Curriculum. If I'm looking for books on a specific person or culture, geographical location, or other topic, I can just google Living Books or (American Revolution, France, The Human Body, Martin Luther King. Jr., etc) and then I look at the websites that generate, and look for familiar Charlotte Mason bloggers, because their lists are usually a good place to start. If I can't find it at the library and am considering a purchase, I will read Amazon reviews and look through samples to get a feel for the books. I also recommend looking through the "customers who bought this item also bought..." section. Also, if you find a well written book, look for more books by that author! In the preschool years we keep it informal and casual, with no specific emphasis on academics, though I do make a point to expose my children from the beginning to excellent literature. I get most of my inspiration from Ambleside Year 0 and Before Five in a Row. Simple and effective! For early elementary, I found Five in a Row to be a great fit for us. The book choices are great, the guides are flexible, and we can use lovely picture books to explore every subject. Even if you choose not to take the unit study approach, this is an excellently curated list, and you cannot go wrong with using it as a starting point. Again - check out other books by these authors. All of the "Cranberry" books are fun, and we love Robert McCloskey's books. In fact, we went from Lentil to Homer Price, and are dabbling in Beyond Five in a Row now as well. My kids have learned so much geography (we still love our maps and story disks!) and explored different cultures and our local communities, and learned about families and positive character traits. We've done nature study, learned about life cycles and weather patterns and so much more about our world. This curriculum uses books to show the child how they fit into the world around them. Now that the boys are a bit older, we added our first history program. I chose Beautiful Feet Books, and we started with American History, because that's what was available in our age range from this particular publisher--I truly appreciated their explanation as to why to teach American History first, particularly from a practical standpoint. I want excellent books, right? We are enjoying Beautiful Feet Books so far. The guide is simple--it's basically a reading schedule with a few notebooking activities and some questions/narration prompts. No fluff or busy work, so we always get the lessons done! The particular level we chose is a mix of picture books and chapter books, which works well for boys 7 and 10, and focuses mostly on the people, relaying historical events through the lives of both fascinating and ordinary people. This approach, these living books, allow us to see how other people helped shape the world we live in now. Beautiful Feet Books focuses mostly on history, but they do have some individual courses in science, music, geography and character studies through literature. I'm definitely planning to use them again! I've thought about designing my own curriculum, but at this point in our homeschool, I feel like it would take too much time and effort to research the resources and design activities to supplement the books. I feel like choosing a program that is laid out, but flexible, meets our needs. Five in a Row and Beautiful Feet Books both give enough guidance without being overwhelming, but they are also flexible enough that I can add an activity or supplemental books, or manipulate/tweak the lesson plan without sacrificing the integrity of the program. BFB only has one science package through, so I am still looking for other science choices to keep on my radar for the next few years. 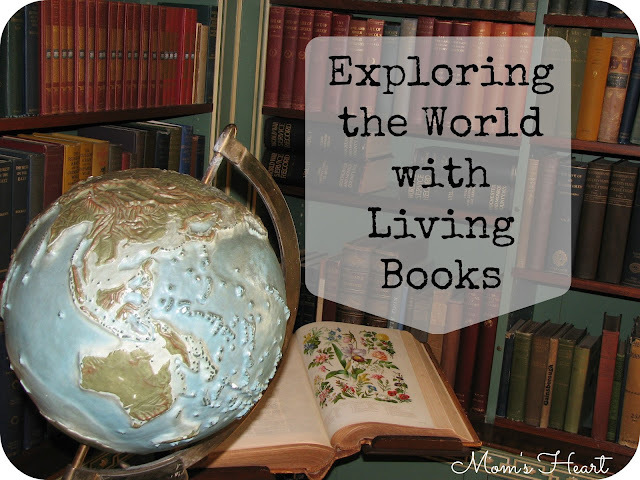 Do you use living books? Do you use a curriculum or design your own plan with living books? My youngest really enjoyed Five in a row (Cranberry Thanksgiving is family favorite, now). I've looked at Beautiful Feet---the Geography study looks enticing. I'm looking at doing the Geography study next year! It just looks so fun!